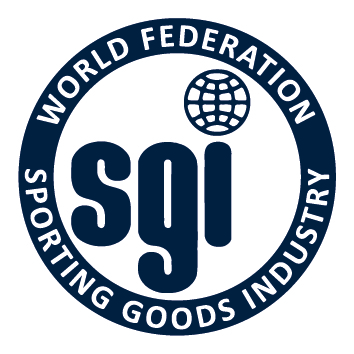 WFSGI – World Federation of the Sporting Goods Industry is the world authoritative body for the sports industry, a member of GAISF and officially recognized by the International Olympic Committee (IOC) as the industry representative within the Olympic Family. The WFSGI is an independent association with no objective of economic character for its own gain and formed by sports and sports-inspired leisure brands, manufacturers, suppliers, retailers, national/regional federations, industry and trade associations and all sporting goods industry related businesses. Our purpose is to represent and inspire the industry, to invest in innovation, promote physical activity, support free and fair trade and do business in an ethical and sustainable way. As part of our mission we facilitate communication and cooperation to enhance competitiveness and innovation. We seek to positively influence the way our products are manufactured, with a focus on people involved in the manufacturing and the environment. Our members are steering the direction of the industry. The future of the sporting goods industry begins with the professional networks that we support. More information on www.wfsgi.org or follow us on Facebook, LinkedIn, Twitter and YouTube.